While smartwatches shine with large, high-resolution screens and a variety of features, the typical fitness tracker is rather discreet, has no significant displays, and has a high battery life. 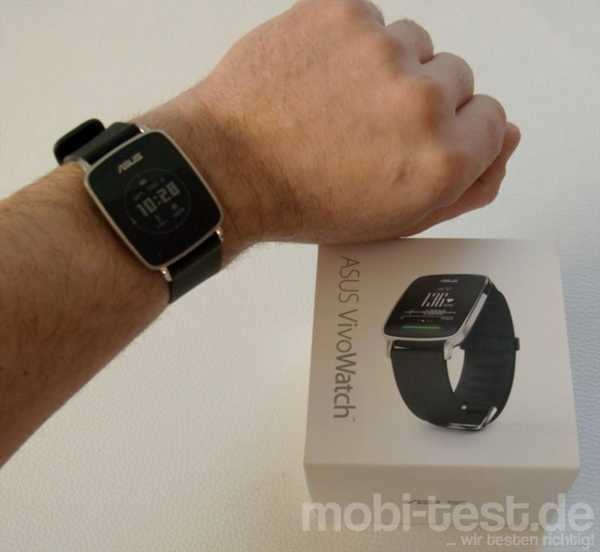 Our current test device can not be unambiguously assigned to one of the two product categories, because the Asus VivoWatch is trying to balance the two. How and if this succeeds, I show you now. The packaging makes a good impression.The plain, white cardboard box was only discreetly printed, even the bottom does not provide any hardware information. The package does not reveal anything concrete about the content, which does not bother me either. Apart from the clock are also the microUSB cable with a matching charging tray, a brief description and the safety instructions in the package. A USB power supply, which allows the device to be charged directly from a socket, has been dispensed with. However, this should also be in every household. If you open the lid, you will see the VivoWatch first . Also here the first impression is a good one: the black design with the silver frame and the discreet Asus lettering makes the fitness tracker look very high-quality. Even if you have a closer look at the fact that this is not a premium model with noble materials, the VivoWatch does not look cheap. I think the look of the device is quite reasonable. However, a negative assessment is that the glossy frame is quite scratch-prone. On the right side is the only button for activating the clock. This is unfortunately somewhat unfavorably low attached, but has a pleasant pressure point and reacts reliably. The fitness tracker with its measurements of 4.3 times 3.6 times 1.1 centimeters rather suitable for slightly wider wrists. The design is, in my opinion, more masculine. To what extent it should be best before the purchase in the shop be checked. The processing quality of the bracelet was saved in my eye too much. It is quite stiff, and only worships the wrist. At the same time, the inner side in the form of a wave ensures that the watch always sits well and does not slip. The downside of the coin, however, is that it strongly attracts dirt particles and shells. Even if the closure with its glossy design has been somewhat faded, it belongs more to the conventional versions. This is all half as bad, because the bracelet can be easily exchanged against conventional 22-millimeter standard bracelets, which I would do with longer usage. Despite the mentioned criticisms, I am satisfied with the wearing comfort of the Asus VivoWatch by and large, which is mainly due to the low weight and the compact size for a display of this size. The display of the Asus VivoWatch is something special, because it is quite large for a fitness tracker with 1.28 inches. The resolution of 128 by 128 pixels, however, is unfortunately very low, also colors the user completely, but he can take a significant step formation. Nevertheless, the LC-display convinces me through the anti-reflective layer, which allows the reading of contents even under extreme sun exposure. The more light is available, the better the content is readable. The slightly weak background lighting ensures that you can read something in the dark. Operation is via the touchscreen. If the device is activated via the side button, you can scroll through the various menus via side or vertical wipers. Besides time, alarm, activity in the form of consumed calories and number of steps as well as UV index, one can also display notifications or the so-called Happiness Index, HI for short. All in all there is nothing to complain about, the touch-screen reacts reliably and quickly. The great advantage of the low-resolution display and the lack of background lighting is the outstanding battery life of up to 10 days. For average usage, the watch stops well for a week.Charging over the charge tray works flawlessly, the VivoWatch locks securely and is reliably supplied with power. The charging process takes about 1-2 hours. Since the required power supply is missing, you have to access a USB port on the PC or an existing power adapter. Unfortunately, there are also some impractical limitations: if the battery drops below 25 percent, the pulse meter and hence the sleep analysis are deactivated. If you want to record further data without interruption, you have to quickly return to the socket. 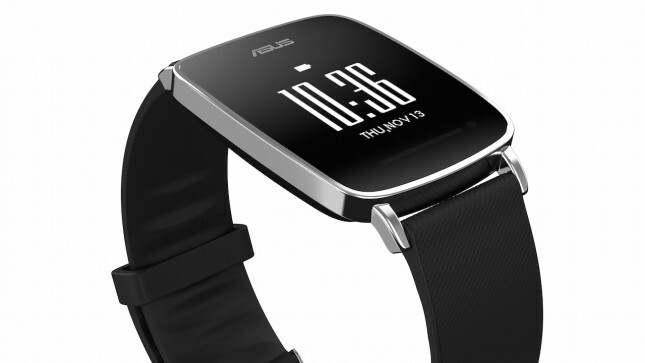 However, the battery of the Asus VivoWatch reaches peak values. Unfortunately, the watch view is slightly different: the user can only select between three different watch interfaces, two digital and one analogue. Additionally, the date, the battery status, active alarms and Bluetooth connections are displayed. In addition to the clock display, a pulse measurement is also possible. This takes about 5-10 seconds and is then displayed live. In addition, the heart rate is automatically recorded and stored every 20 to 30 minutes. In addition, you can still see the burned calories and running steps as well as a UV index. You can also set the alarm clock to wake up on time in the morning. However, this is directly at the clock somewhat cumbersome, which is why I prefer the app back. Likewise, you are informed about incoming notifications of the connected smartphone and gets a preview with the first words of the message displayed. Unfortunately, there is no way to interact with these notifications, so you have to go to the smartphone to read the message completely or to respond. Also , if this feature is missing, I find the notifications associated with vibrations very useful. In addition to the pure pulse measurement, the Happiness Index is also recorded, the German feel-good index is recorded over the day. This consists of movement targets, pulse measurement, sun exposure and sleep analysis. The latter is automatically determined by means of pulse and movement and records the sleep duration as well as low-sleep phases automatically. The solar load is measured by means of a special sensor and warns if the sun intensity is too strong. These data are all collected in the app, which also shows the information very clearly. The app called HiVivo is relatively simple and collects all information for a clear presentation, emphasizing the Happiness Index. As already mentioned, the alarm can be adjusted via the app. 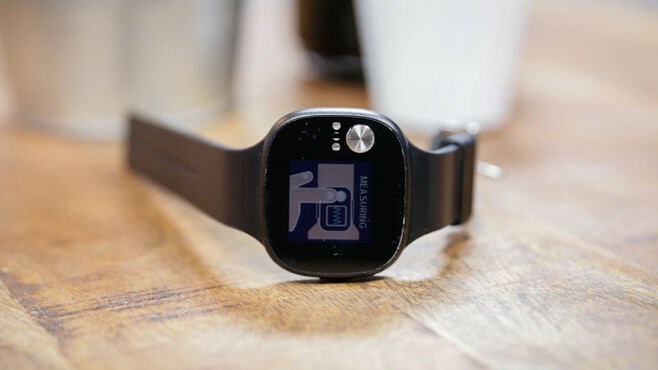 Practically, the friends function is for a common target, which can only be used, however, if they also have a VivoWatch . 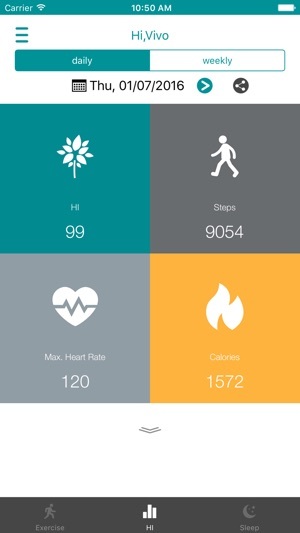 Overall, the HiVivo app provides all the features that a fitness tracking app should provide. 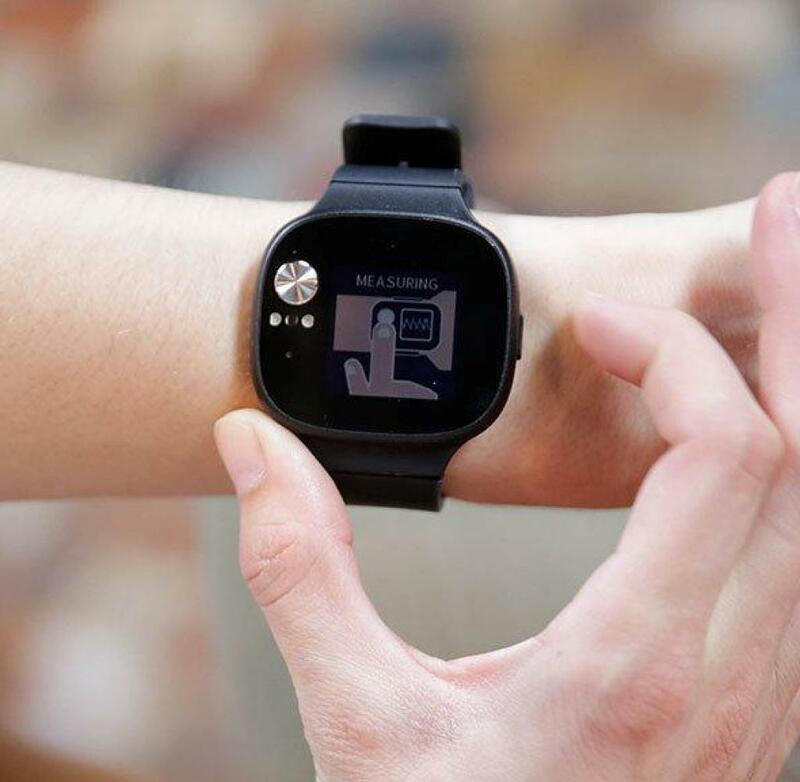 The Asus VivoWatch is easy to pair and use with iPhones as well as Android smartphones.Windows Phone users will continue to search for such devices in vain, because the VivoWatchis not compatible with them. The device is very robust and even water and dust resistant according to the IP67 standard.Although you could swim in theory, I feel uncomfortable at the thought. Showers however works problem-free. Dust can not affect her, by the way, the bracelet, which unfortunately attracts something. The Asus VivoWatch is a good fitness tracker with a small display, which, in addition to the pure step counter, also monitors the pulse and determines the duration of sleep. It also warns against excessive sun exposure and summarizes these data individually, but also collected in a well-being index in the corresponding HiVivo app. As a small highlight, the device also informs about calls and displays messages in a preview. Even if it is still far away from a Smartwatch, these are useful features that remind you of that product category. The display is particularly good when exposed to direct sunlight, and is also very easy to read at night. The battery provides a very good usage time of one week and the case is handsome, even if not magnificent. Savings were made on the materials and the cheap bracelet.However, the latter can be exchanged. The price is 149 euros at tucsonsmartwatches.com. In summary, the VivoWatch is a bluetooth smartwatch. For people who place less emphasis on a chic smartwatch and instead pay attention to fitness features and battery life, the Asus VivoWatch is the right choice and worth a recommendation. 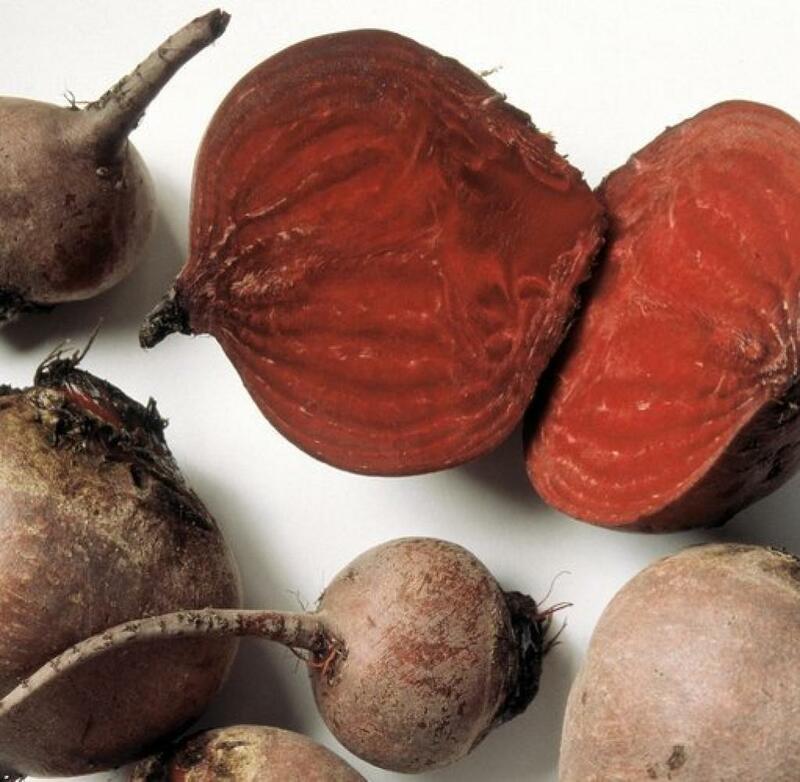 Blutdruck: 120 oder 140 – Welche Werte sind normal?